Ms. Mullins' Class - Karina Fann, Rachel Choate, Lora Roberts, Lily Guenther, Brady Davenport, Grace Campbell, Riley Poteete, James Vassar, Austin Mitchell, Cameron Decent, Sofia Gomar, Alexis Freels. 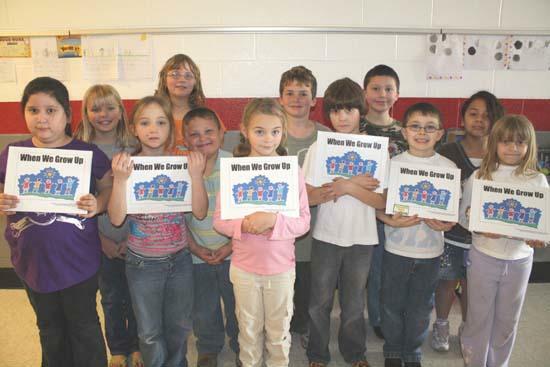 2nd grade students at West Side School are now authors. Mrs. Naylor's and Ms. Mullins' classes were asked to write a story and draw a picture on a specific subject. Mrs. Naylor's class wrote about their pets and titled the book, Me and My Pet. Ms. Mullins' class wrote about what they want to be when they grow up, and titled it When We Grow Up. West Side librarian, Chassity Burks, sent the stories and pictures off to be published in book form. Great job 2nd grade!